Do you have the urge to go and get a burger ! Not Long Till Mothers Day and Mandi's Day! This year I shall be sharing my birthday with Mother's all over the world!! This is the second time since becoming a mum that it has fallen on my birthday, so my children have declared that I WILL get extra presents to compensate!! 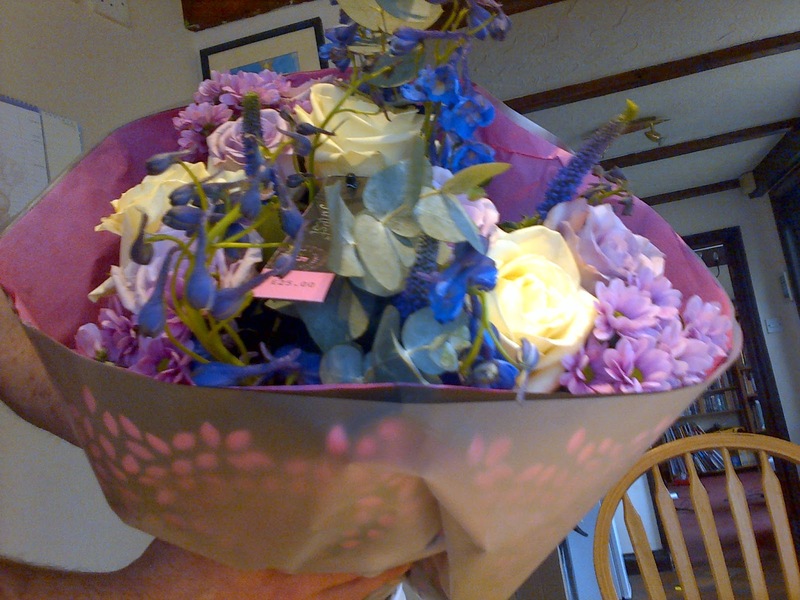 The great thing about this bouquet is that it can be purchased in store, which means you can actually see what you are purchasing, and pick the bunch that appeals to your mum's taste. It also means that if you leave it until the last minute, you can stop off at your local Tesco store and pick the perfect bunch. In 2003 just six weeks after Neva was born she underwent a quadruple bypass and we very nearly lost her, which was a VERY scary time. Thankfully she pulled through and made a full recovery, in the last 11 years she has seen my family grow from three children to seven and my sister Karen added another granddaughter to the mix, so this is for you Mum/Nanny, for all those babysitting duties ! Kaide has been on and on about Pop Chef ever since it was first advertised on the television, so when we were asked if we would like to review it, there was a resounding YES from all parties!! 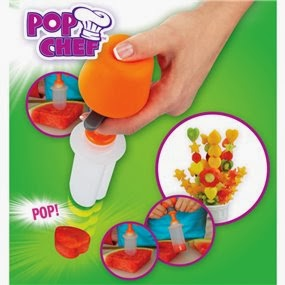 The Pop Chef is by Character and consists of six fun shape cutters that you fix on to a small orange bubble, that you then pop ! I must admit, when I first saw it advertised I was slightly sceptical, when Xene was a toddler and didn't eat very much I would use different shape cutters to make fun looking sandwiches, which she would eat, so why would I need to use this gadget. However the reaction I got when I used this to make various shaped snacks, it was certainly worth it, and the popping made it so much easier than trying to prise the sandwich out of a normal cutter. The cutters are much longer than a simple cookie cutter, meaning that you can Pop much larger creations. Neva has a birthday coming up and she is already talking about the different shaped food masterpieces she will create. 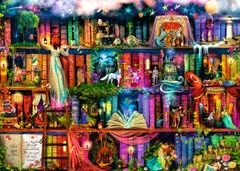 Enter the world of fantastic stories and magical tales with this richly-coloured and detailed scene. Characters from famous books come to life on the shelves, so we can see The Mad Hatter enjoying tea, Snow White pondering whether to take a bite of the juicy red apple and Cinderella leaving her glass slipper on the steps of the palace. 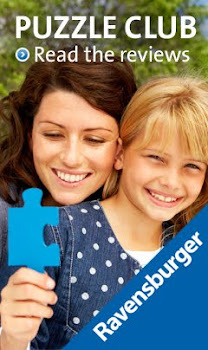 My idea was that we would take it on holiday and in the evening we could sit and do the puzzle together, which sounded great, however I didn't count on the whirlwind toddler doing his impression of Taz and sending puzzle pieces flying in all directions!! So, for now this puzzle is secretly kept in my puzzle holder and it will be brought out on the evenings that Tyrus has gone to bed early, who knows maybe you will complete it before me!! It is a very colourful and fun puzzle with lots going on and Eowyn was captivated by the box, now all I have to do is find a quiet time and place to complete it!!! High School, College and GCSE Options!! 2014 begins another educational chapter in the Morrison household, currently Xene is studying hard for her GCSEs, which she will be taking in just a few weeks time - how scary is that, doesn't seem like two minutes ago I was taking my own!! After those are finished, its a LONG summer holiday and then off to College in September, Xene is very pleased as she has been offered a place at the College she had down as her first choice, so a mix of A levels and a BTEC await her. He will have to wait a few months to see if he has been able to take his first choice of subjects. Born Lucky or Make Your Own Luck ? 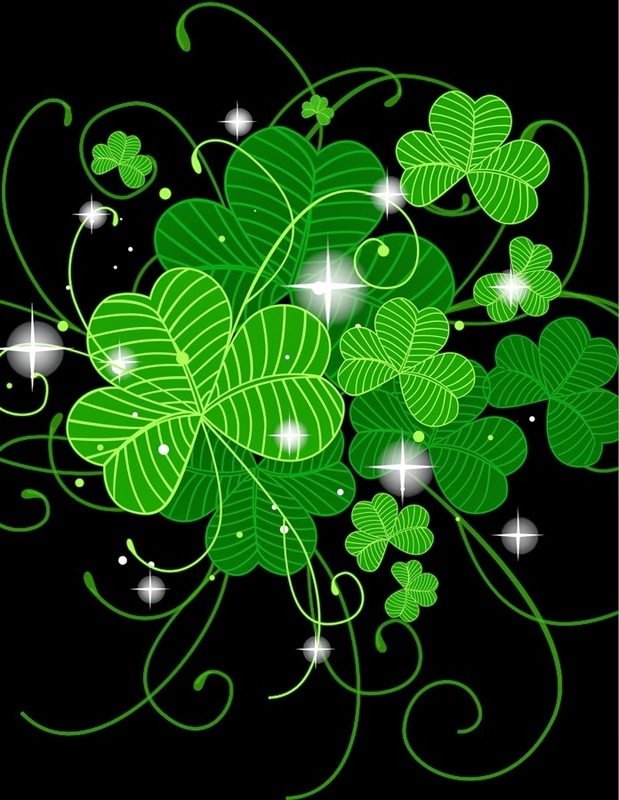 Do you believe that a person is lucky ? My mum always says that I am a lucky person, but that she isn't. Which made me start thinking about things I had won. At the end of last year I found out that I had won a years free shopping, which is amazing and I love spending the vouchers every month. It was a simple entry to a facebook competition, so no real skill involved. 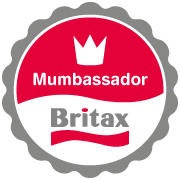 Before I began blogging I was quite a keen comper, I would spend my evenings entering competitions, scanning my shopping for entry forms, filling out the WIN pages of the children's magazines. I had quite a few wins, which certainly helped at Christmas and Birthdays, but I had put the effort in, so am I just naturally lucky, or just that I have put in more effort than, maybe my mum!! Her sister has always been lucky, especially at the Bingo Hall and on the Fruit Machines, where someone would argue, it is purely luck. 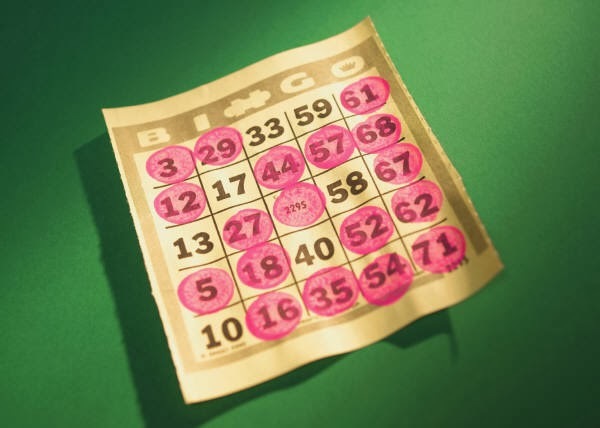 She decided to play online bingo with Paddy Power and I must admit she has been pretty lucky, but I suppose you could argue that it would depend on how much money is spent to get the win!! This post is brought to you in collaboration with Paddy Power. Snot, Coughs and High Temperatures Please Leave The Building!! The Morrison house at present resembles a cross between a chemist and a hospital!! It all began with Lochlan two weeks ago announcing that he felt yuck!! Since then it has been one child after another, and Asa too, it starts with a high temperature that you could heat the entire house, the accompanying hallucinations of varying degrees, followed by bucket loads of snot, a barking cough and if you are really lucky, a raging sore throat to go with it!! I am currently sat here on the sofa at 4.30am with the latest victim of `the bug' little Tyrus is watching The Magic Roundabout giving me the occasional little smile, he has already been in the bath at 3.30am because his coughing had made him sick. I do not have time to be ill, it usually hits me at the start of any school holiday, like it knows I can relax and be ill, however the next one is quite a few weeks away, so hopefully it will have forgotten about me by then!!! When we go on holiday, we always have to try and juggle activities to do with an age range of 0-16, which is becoming slightly more challenging! 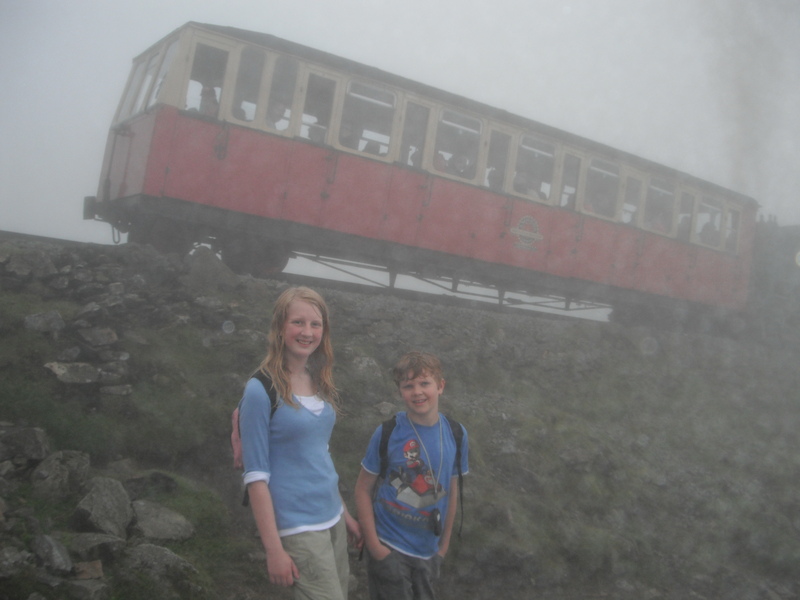 On our holiday to Wales last year, the two eldest announced that they would like to climb Snowdon with dad, we had considered the train a few years before but the weather was bad and we decided against it. I stayed at the cottage with the smaller children, whilst Xene, lochi and Asa climbed the 1085 metres!! 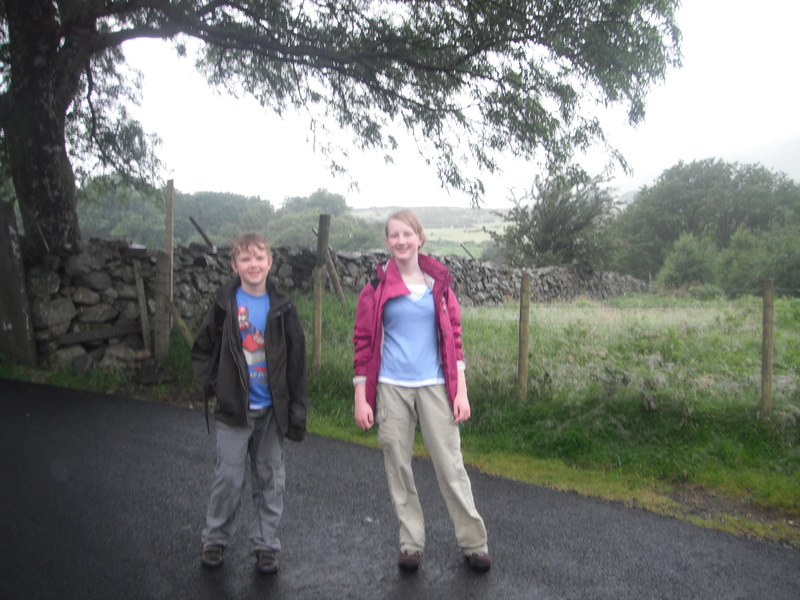 The three of them were up early (6.30am ,which by our standards is early on a holiday) a big breakfast, lunch packed and a short drive from the holiday cottage to Snowdon. 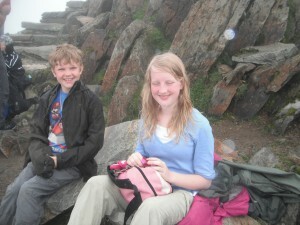 Xene and Lochlan happily fell back to sleep in the car, and awoke at Llanberis at the foot of Snowdon. 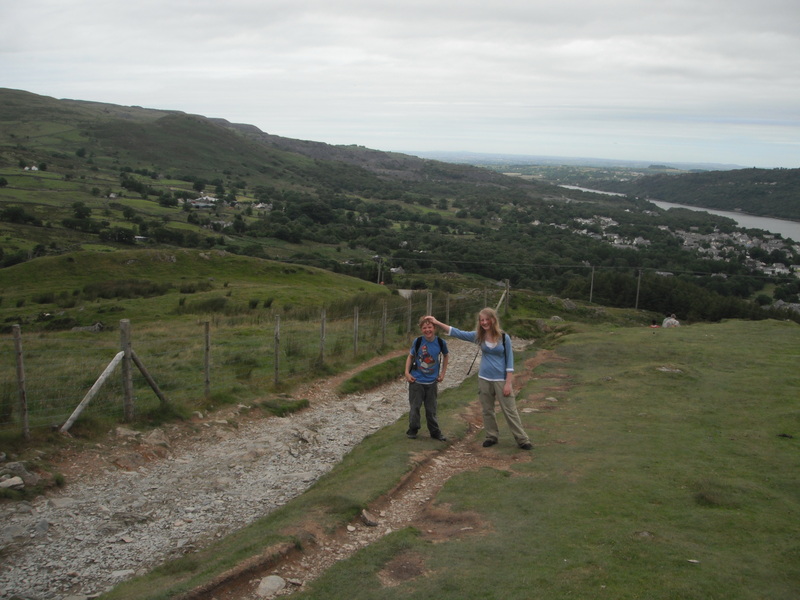 They chose, what they read was the easiest route using the Llanberis Path , and Xene was actively involved in a little bit of route planning. 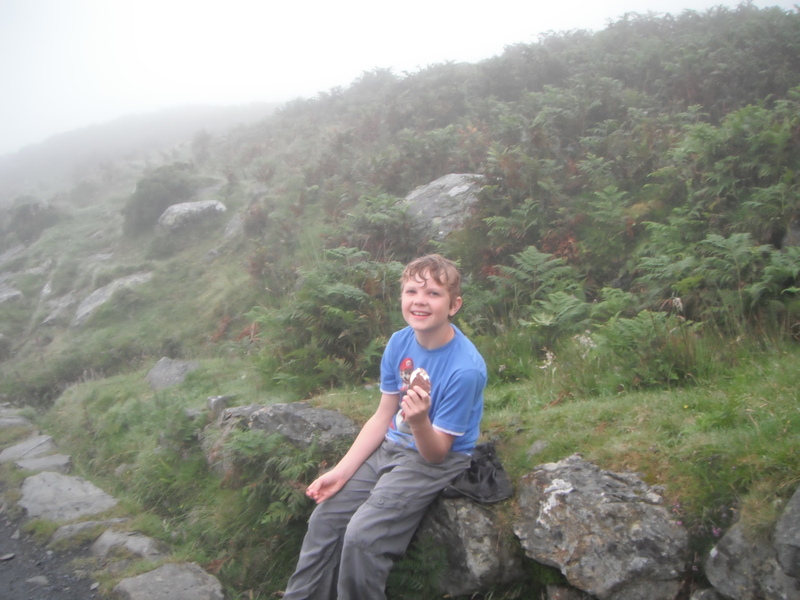 North Wales on occasion can be bright and Sunny in August, but on the day they chose it was drizzle and thick mist. They set off with enthusiasm past the Snowdon mountain railway station and up the path, it had just turned 8am and there was no one else about. 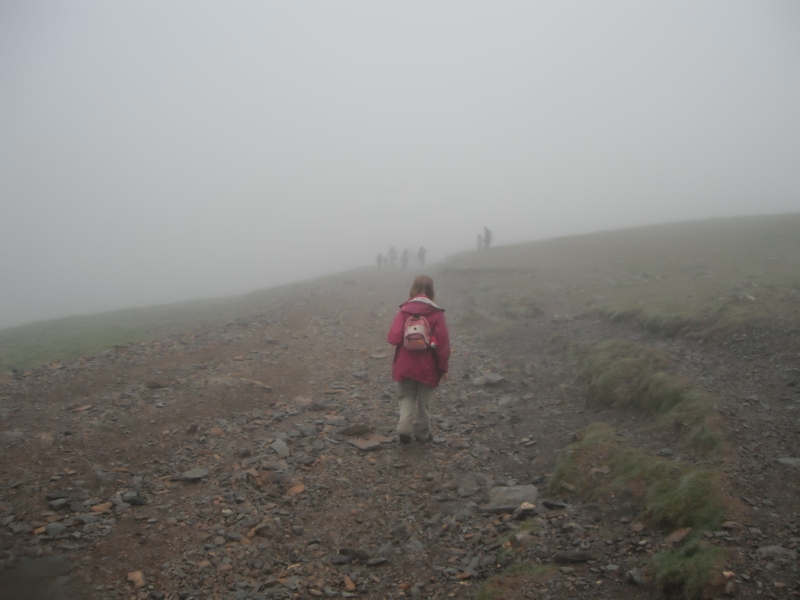 The Children bounded with enthusiasm, they left the track and headed onto the footpath to the summit, which was clearly marked. 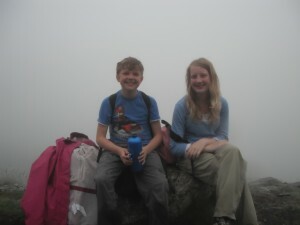 Perhaps a hidden benefit was the fact the visibility was 40 meters in the fog and as a result, neither of the children could actually see how far they had to climb! Over the years we have worked out if a child wants to stop, the best thing to do is to stop, they tend to recharge quite quickly, they stopped every 30 - 40 minutes, had a drink, ate, checked the map. Lochlan very proudly carrying an altimeter round his neck, to monitor upward progress. They passed the halfway house cafe, a quaint little rail side building, which on better days I am sure has wonderful views across the valley, the path became more rugged and vegetation a bit sparse. The path was hard going, you really do need a good pair of boots. 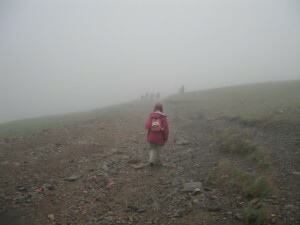 The path got steeper, they passed 800 meters, but then suddenly it all changed. At 863 meter precisely Lochlan went into meltdown, "That's it, You're Mad Dad, I am not going any further, I am going to die" and sat on a rock in the middle of the path refusing to move. They satdown, drank, ate and chatted. Xene actually got cross with her brother, as she was desperate to get to the top. 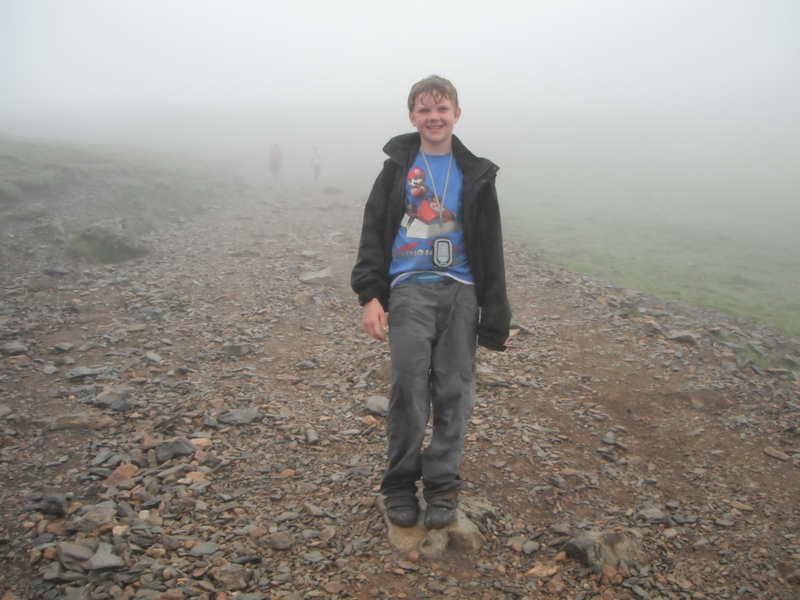 Other walkers passed and smiled politely, Lochlan sat steadfast on a rock, still full of a mix of anger and exhaustion He demanded to be carried on dad's shoulders, this was not really an option. Time passed and eventually he agreed to go another ten meters up, Asa pulled Lochlan then they went another ten and stopped, with Asa still pulling Lochlan (which Xene found hilarious), this recharged him until they got to 900 meters (the altimeter was the surprise motivational key on the whole journey) at this point Lochlan had worked out it was 3 steps to the meter, it was not that far, and overtook Asa, whowas struggling to keep up with two teenagers bounding up the path. They reached the base of the summit and climbed the final few steps to the top. Both the children were really impressed, but as for the view, Asa could see the children, but not a lot further. Importantly, they both had really achieved something and we were both really proud of them. They sat on the rocks and had lunch (although Lochlan had half of Asa, having eaten everything he had at our numerous stops up the Mountain). 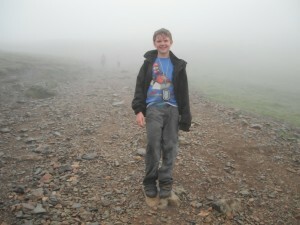 After a quick browse in the cafe at the top, they walked around the summit and began to descend. On arrival back at around 3pm, both Xene and Lochlan were bursting with stories! 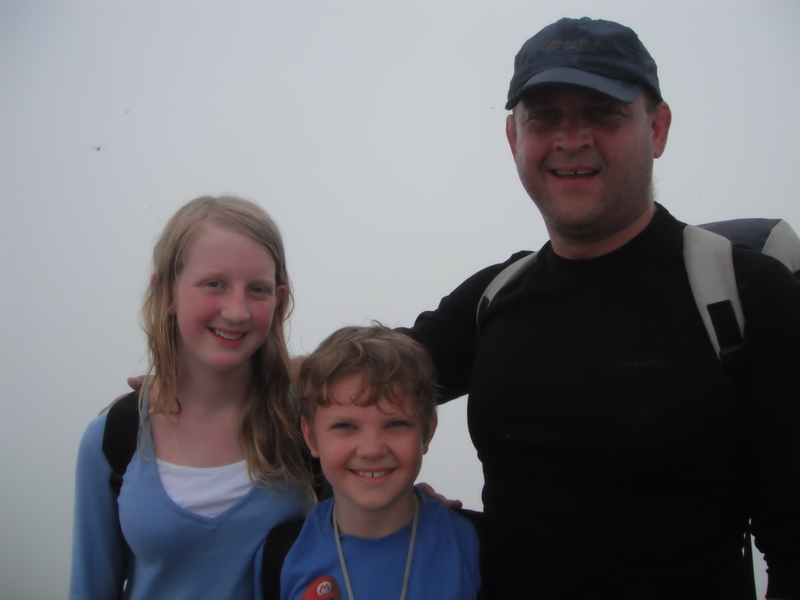 Our next Wales holiday will hopefully include another Snowdon trip, but with a few more walkers, as Neva and Kaide are very keen to go next time, maybe we can all go in the future, if Asa and I don't get too old. Wales is one of our favourite holiday destinations, ad is always top of the children's lists when we ask them where they would like to go. They are on twitter and facebook and we would definitely recommend as a family friendly holiday. 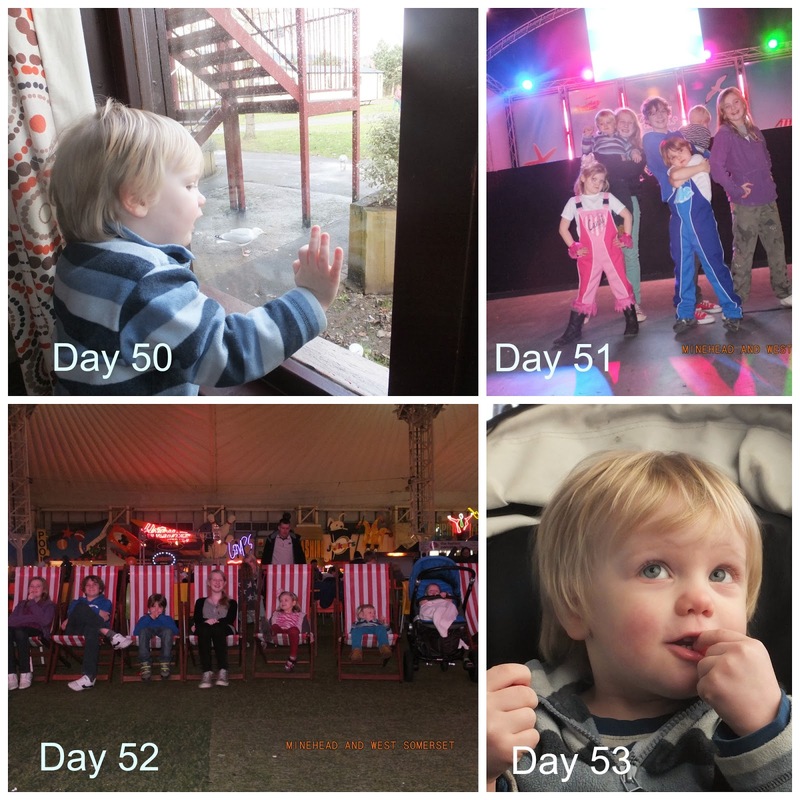 February Half Term was very much about Butlins! Day 47 - Another use for strawberry pencils ! Day 50 - Tyrus was fascinated by the seagulls that gathered outside our apartment. Day 59 - Viggo has his first taste of banana and loved it! Neva and Eowyn love different art and craft projects, especially girlie type things, so when we were asked if we would like to review the Daisy Chains set, they were very enthusiastic, as you can see from Eowyn's big grin! A large pink and yellow flower, that attaches to a dark pink base, 30 fabric flowers, 20 flower beads, 10 round beads, 1 picker, 20 flower stems and 4 clips, and of course the instructions! The instruction leaflet was very easy to understand and it had lots of colourful step by step instructions for the girls to follow, Tyrus also came to have a look. Once completed, the first the girls turned into a bracelet, and then they made a larger one and Eowyn had a garland for her hair. Both girls enjoyed making the Daisy Chains and I didn't hear a peep out of them whilst they were doing it, which is always a good sign that they are deeply engrossed in their activity. 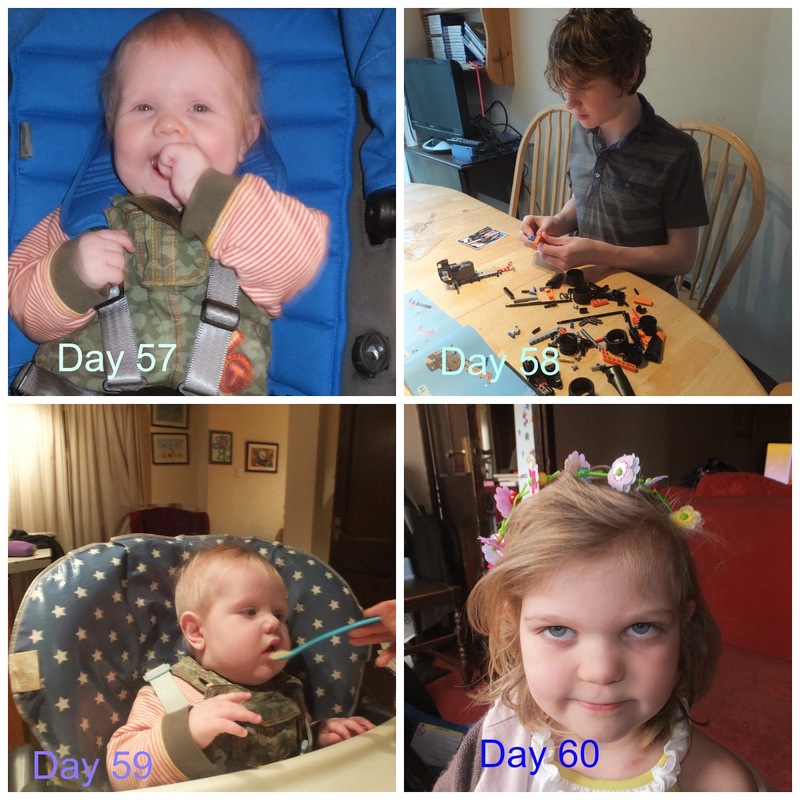 The recommended age is 4+ which I think is correct, Eowyn was able to do it all, with just a little assistance for the fiddly bits from Neva. 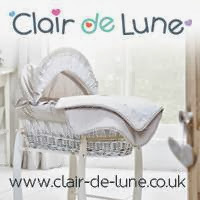 If you have a little girl that would love this, why not head over to www.coolcreateclub.co.uk which has some fab ideas and cool creations.